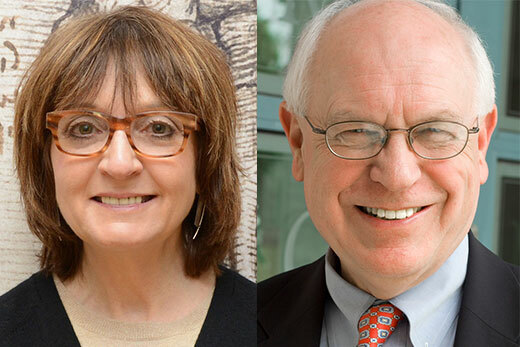 Emory faculty members Helen S. Mayberg and Carl R. Holladay are among 228 individuals elected this year to the American Academy of Arts and Sciences. Two Emory University faculty members, New Testament scholar Carl R. Holladay and neuroscientist Helen S. Mayberg, have been elected to the American Academy of Arts and Sciences (AAAS), one of the nation’s oldest and most prestigious honorary societies and a leading center for independent policy research. Holladay and Mayberg are among 228 individuals in the class of 2017 elected from Emory. As AAAS members, they will be called on to contribute to the academy’s studies in science and technology, global security, social policy and American institutions, and the humanities and education. The honorees will be inducted at a ceremony on Oct. 7, 2017, in Cambridge, Massachusetts. The full list of new members is on the Academy's website. Holladay, the Charles Howard Candler Professor of New Testament, has been a member of the Candler School of Theology faculty since 1980. He also is a senior fellow at the Center for the Study of Law and Religion at Emory Law and a popular lecturer at colleges and universities around the world. His research focuses on Luke-Acts, Hellenistic Judaism and Christology. Holladay is the author of nine books, including “A Critical Introduction to the New Testament: Interpreting the Message and Meaning of Jesus Christ,” which is used extensively by seminaries and ministers, offering historical context as well as an orientation to religious, theological and ethical issues surrounding Jesus’s message. His most recent book is “Introduction to the New Testament: Reference Edition,” which roots each of the New Testament’s 27 writings in their historical, literary and theological contexts. Holladay also co-authored “Biblical Exegesis: A Beginner’s Handbook,” a widely used introductory text on exegetical methods, theory and practice, now in its third edition. His “Acts: A Commentary” provides a theological, contextual and literary interpretation of the biblical book, paying attention to Acts as a rich narrative that accounts for the development of the early Christian church. An ordained minister in the Church of Christ, Holladay serves on editorial boards for multiple scholarly journals, is a member of the Society of Biblical Literature, and currently serves as 2016-2017 president of the Society for New Testament Studies. Holladay joins E. Brooks Holifield, Charles Howard Candler Professor Emeritus of American Church History, and Carol A. Newsom, Charles Howard Candler Professor of Old Testament, as the third Candler faculty member to be elected to the Academy in the last six years. Mayberg is a professor in the departments of psychiatry, neurology and radiology at Emory. She holds the Dorothy C. Fuqua Chair in Psychiatric Neuroimaging and Therapeutics, and is co-founder of the Emory Neuromodulation and Technology Innovation Center (ENTICe). Mayberg received an undergraduate degree in psychobiology from the University of California, Los Angeles, and an MD from the University of Southern California. She is a board certified neurologist, trained at the Neurological Institute of New York at Columbia University, and was a post-doctoral fellow in nuclear medicine at the Johns Hopkins Medical Institutions. Mayberg heads a multidisciplinary depression research program dedicated to the study of brain circuits in depression and the effects of various antidepressant treatments measured using a variety of functional and structural imaging tools. The primary focus of the lab is to develop imaging and physiological based algorithms that will discriminate depressed patient subgroups and optimize treatment selection at all stages of the illness. Imaging findings provided the foundation for development and testing of deep brain stimulation (DBS) of the subcallosal cingulate region (Area 25), a novel intervention for patients with treatment resistant depression. In 2013 she was named one of the university’s “Game Changers” in recognition of her pioneering DBS research, which has been heralded as a one of the first hypothesis-driven treatment strategies for a major mental illness. At Emory, DBS studies aim to refine, optimize and extend the potential of this treatment strategy, with experiments designed to characterize and define mechanisms mediating DBS response and to develop biomarkers that will improve patient selection, enhance precision of surgical targeting and optimize stimulation parameters. Mayberg is an elected member of the National Academy of Medicine, the American Neurological Association and the American College of Neuropsychopharmacology. She is active in the Society for Neuroscience, The Organization for Human Brain Mapping and the Society of Biology Psychiatry, where she previously served as president. Among various honors, she is the recipient of the Falcone Prize in Mood Disorders Research from Brain and Behavior Research Foundation (formerly NARSAD), the Arnold Pfeffer Prize from the New York Psychoanalytic Institute, the Raymond Adams Award from the American Neurological Association, and Roche-Nature Medicine Senior Award for Translational Neuroscience. Since its founding in 1780, the American Academy of Arts and Sciences has elected leading "thinkers and doers" from each generation, including George Washington and Benjamin Franklin in the 18th century, Daniel Webster and Ralph Waldo Emerson in the 19th, and Albert Einstein and Winston Churchill in the 20th. The current membership of 4,800 Fellows and 600 Foreign Honorary Members includes more than 250 Nobel laureates and more than 60 Pulitzer Prize winners, and brings a wide range of expertise to the academy's multidisciplinary analyses of contemporary issues.